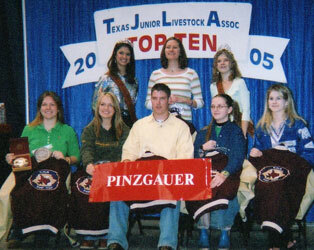 Texas Circle P Ranch and Circle P Pinzgauers are strong supporters of youth programs. We believe that the future of both the Pinzgauer breed and the agriculture industry as a whole depend on today's youth growing into knowledgeable beef producers, cattlemen, and cattlewomen. It is in that spirit that we are yearly supporters of the Texas Junior Livestock Association and the Junior Pinzgauer Association. Our daughter, Melissa, had a very successful junior show career throughout Texas and the nation, and we feel that this is our opportunity to support the organizations that have been such a big part of our family for the past several years. If you are interested in starting your own junior Pinzgauer show career, please contact us. Call us at 512-446-4141 or email us at pinz@texascirclep.com. 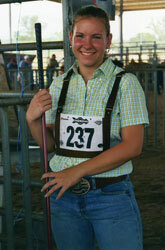 Let us help you find your own path of success through the junior livestock associations. 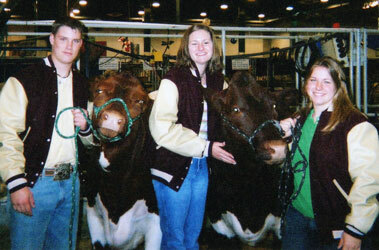 Circle P Pinzgauer Junior Exhibitors at the 2005 Houston Livestock Show Junior Heifer Show.